"I'll give you a potion that will confuse the brain and turn Glaucus into a fool without reason." In 1913, the motion picture was undergoing vast changes. The public was no longer satisfied with little slices of life up on the screen; spectacle was becoming the order of the day. At that time, Italy was the source of some of the most interesting epics, in no small part because they had the sets for ancient times ready-made for them. Yet at this point the vocabulary of cinema had not yet evolved; films were still chained to the concept of the tableau, where a title would describe the action, and then it would be depicted on the screen. Cross-cutting and camera movement were still rarities. 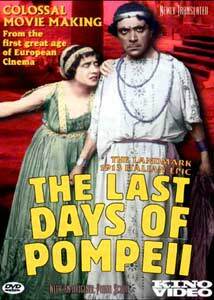 Such is the case with Mario Caserini's epic of 1913, The Last Days of Pompeii. This picture enjoys the distinction of being one of the first disaster films ever made. Based closely on the novel of the same title by Edward Bulwer-Lytton, which was wildly popular in Victorian times and is all but unread today, the film version suffers a little from assuming a familiarity with the story. However, the film hews closely enough to standard melodramatic fare that it's not too difficult to follow without acquaintance with the source novel. The episodic story is centered on events occurring in AD 79 Pompeii, around the pathetic figure Nidia, a blind slave girl (Frenanda Negri Pouget). Nidia is owned by the abusive Stratonica, and is rescued by Glaucus (Ubaldo Stefani), who buys her. Nidia soon falls in love with her new master, but unfortunately he is in love with the beautiful Jone (Eugenia Tertoni Flor). At the same time, Arbace, priest of Isis (Antonio Grisanti), is also in love with Jone. This love quadrilateral can hardly proceed happily. Nidia's affection and jealousy are noticed by Arbace, who lures her with promises of a love potion for Glaucus. Alas, it's a trick, and Arbace has instead given her a potion that induces madness. Before long, Glaucus has gone wacko, Arbace has absconded with Jone, Nidia is in despair and, oh yeah, Mt. Vesuvius is about to erupt and bury the whole bunch of them in ashes. As is the case in Bulwer-Lytton's novel, we take entirely too long with the goofy romance and spend far too little time with the volcano erupting. The special effects in the concluding chapter are sensational for the time, with a fairly convincing optical of the eruption. The violent red tinting during this sequence helps convey the sense of doom quite nicely, in contrast to the quite subtle tints during the preceding majority of the film. In contrast, a double exposure earlier in the film looks extremely crude. Clearly the art of cinema and special effects are still struggling to find their way here. The tableau style makes it difficult for a modern audience to keep interest in the proceedings, but there is undeniable, historical interest in this presentation. The acting is fairly well restrained for a silent melodrama. The production values are excellent, with elaborate costumes and sets (though on occasion a painted backdrop is readily visible). We also get an epic scale in the large crowd scenes which would reach its culmination a few years later in Griffith's Intolerance. This was a greatly influential film in its day, and its presentation on DVD by Kino is certainly to be welcomed for its historical importance. Image Transfer Review: The image quality is excellent for a film nearly 90 years old. There are the usual speckles and flickers as are to be expected, but the only section which seems to have extensive damage is the very beginning of the eruption sequence. The tinting is sensitive and subtle throughout. Blacks are very good, and a tremendous amount of detail is visible throughout. Unlike many silent films, this one never seems overly contrasted, and there is always plenty of variation in greyscale. Audio Transfer Review: The new piano score, compiled from such classical composers as Verdi, Saint-Saens, Ponchielli, Mussorgsky, Handel and others by Beatrice Jona Affron and played by Martha Koeneman, is suitable for the film and quite effective. The recording is DD 2.0 and comes through crisply without noise or hiss (though one can occasionally hear pages being turned). There is little to find fault with here, other than the anti-Semitic undertones of the music from Mussorgsky's Pictures at an Exhibition used as a theme for the Vesuvian Witch. This is in questionable taste today, though it probably would have been taken in stride back in 1913. Extras Review: There are brief liner notes on the production contained on the insert, but these are quite limited in scope. The chaptering is barely adequate. The newly translated subtitles fit nicely into the flow of the film. Otherwise, nothing. A somewhat silly melodrama, made in a distinctly old-fashioned style with stationary camera and medium shots presented as tableaux, but the production values and historical interest make this film nonetheless worth a look for students of film history and those interested by silents.